← Now With 500% Less Scripting! 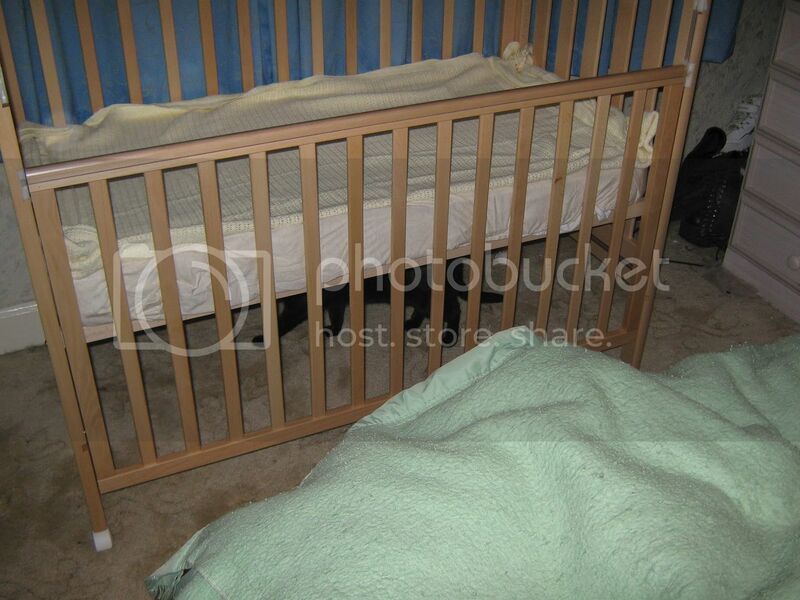 Until today, Leah has shared a bedroom with us since she first came into this world there. Her crib fit beautifully under the windows, and all were pretty darn happy with things. She got the hang of sleeping through the night pretty freaking early, so we managed to breeze through that first year (bar the first month or two) with no real problems. But in the past couple of weeks, we’ve entered a period where she’s both in pain from teething, and trying to assert her own adorable and playful will. My poor husband has been pulling all-nighters trying to console her, and all for say… the cat deciding he wants to get off the bed, or one of us turns over in our sleep. It’s just not a way to live, and so, the time to boot her has come. She is now set up in the guest room, which really… we always knew that it would eventually be her bedroom, to include having plans in mind that will enable us to continue using it as a guest room. It’s also ideal, in that the cats are semi-tolerant of that door being shut; they absolutely cannot handle our bedroom door being shut, since Batman is a desperately clingy momma’s boy and will be inconsolably miserable if he can’t walk all over me all night. But it puts her closer to her ball pit, at least! And, I think, she’s okay with that. And I, instead, get taunted by the exercise bike.. rapture! Take, for example, my stance against battery-powered toys. There is nothing that can convince me that someone under the age of one (or two) needs a battery-powered toy. The whole ‘makes lights and sounds!’ thing offends me to the core; I do not want my child trained into expecting instant gratification, of entertainment at the touch of a button. I want my child to put her hand skills into creating, destroying, exploring, not staring at something flashyflash. I’m also not a fan of TV, for all I love my computer-tastic idiot boxes, so it’s not just babycentric. *cough* But I also accept that my child probably has a rather long attention span for someone her age; she doesn’t need me thrusting things in her face every few seconds. No, she can quite happily go for… half an hour, I guess? Half an hour on her own, poking at books, chasing the cats, playing with her ball pit. She knows how to find entertainment, and the only non-her-but-caused-by-her-noises I have to hear are offended cats (hee! ), and her attempting to play the recorder/tambourine/xylophone/etc. Great pictures. I love the ball pit! If I ever hae a child, I’m so getting one of those!! I am so, so jealous of the ball pit. Adorable!